Would you or your company like to sponsor ConFusion? Wonderful! There are lots of ways you can support ConFusion. 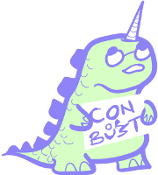 Throw an Event at ConFusion ~ Email Programming@ConFusionSF.org for details. Fees may apply. Fun Runs; Book Releases; Weddings, they have all happened at ConFusion. 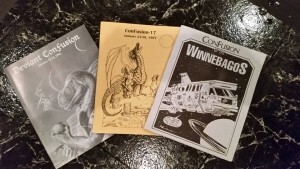 If you have a reason to celebrate, or just want a slot in our program book to let folks know the cool thing you will be doing, let us spread the signal or help organize your event at ConFusion. Send Donations, Gratis Copies, or Freebies ~ Email Chair@ConFusionSF.org for shipping details. 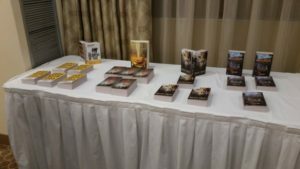 Publishers can send Gratis Copies to ConFusion to distribute to its attendees. 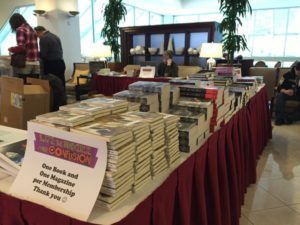 These freebies generate excitement for authors and publishers in a solid market. Game Makers can send tournament supplies or prizes for our game room attendees. These help introduce folks to your games and create new markets. Any Company can send swag/branded items. Name recognition means a lot in a global market. ConFusion attendees are adventurous and willing to try new things, especially when they are associated with an event they love. 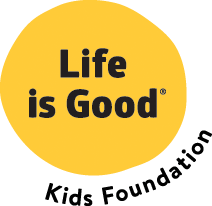 Want to help ConFusion in its effort to give back?